As expected it rained hard all night long! We left Madison campground for the final time this morning and just around the corner toward Norris there was a huge bull Elk walking across the road and holding up all of the traffic. He had an enormous rack of antlers. We drove across from Norris to Canyon and then down to Fishing Bridge where we had lunch, again looking, but not seeing much. It was then around the shore of the Yellowstone Lake and back down to West Thumb and on down to the South Entrance. We arrived back down into Grand Teton and Jackson town at about 5 o'clock and had already phoned ahead and booked ourselves in to the KOA at South Jackson near Hoback junction (Kampground of America, a franchise of campgrounds all across the US & Canada that offer many facilities that the back-country parks don't such as electricity hook-ups, laundry & hot showers). I had booked full services so we had water, electric & sewer all connected and also internet wi-fi access. This was the first time in 2 weeks that we'd had all services and I had a luxurious hot shower and we got all the laundry done as well. After browsing 161 E mails I began to wonder if it wasn't much nicer up in the back-country well away from modern technology. After a few phone calls home we headed back up to Jackson town and picked up some more groceries from the huge Albertsons supermarket and some alcohol from the neighbouring Liquor store which I was pleasantly surprised to find open on a Sunday. We booked in again at our favourite campground at Gros Ventre and had some lunch as a couple of chipmunks scurried around near our picnic table. After lunch we drove across to Jackson Lodge area and then we parked up next to the lake and beside a tiny little church all made of wood and immaculate inside. It was all open to the public and I couldn't help thinking how it would be abused if it was at home in the UK. After a drive back along Jenny Lake shore we stopped near the campsite as I photographed a Pronghorn crossing the road and then grazing in a meadow near the river. 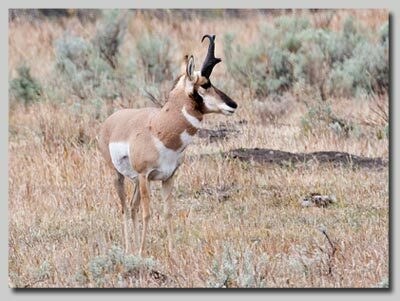 Pronghorn Antelope in Grand Teton National Park. Later I walked up river to see if the beaver lodge was still there. Unfortunately it had been washed away although there was plenty of evidence in the form of chewed off trees to show that they had once been there. It was a full moon and it lit up the campsite as we grilled burgers & bacon on the BBQ and then sat around the campfire drinking beer. As the moon rose it started off the coyotes and we could hear several of them howling in the distance. I'd set the alarm for 6:30 this morning so that I could go to Mormon Row here in Grand Teton to photograph the old Moulton barn that is so familiar to photographers in this area. I've seen dozens of shots of it but as always wanted my own! We were there before the sun had risen high enough to reach the peaks of the mountains but in minutes they started turning pink and as it rose the whole range was illuminated followed by the old barn and its surroundings including the bus load of camera wielding Pacific Rim visitors who lined up amongst the sage brush waiting for the magical moment and clicking at every person and object in sight! The Old Barn at Mormon Row with the Tetons in the background just after sunrise. After I'd exhausted the photo opportunity we headed over to the Snake River section just past the Oxbow Bend at Moran. The river was so much lower than 2 weeks before when we were there and I found out that they'd closed off some of the overflow waters from Jackson Lake thus lowering the water levels in the river quite dramatically, 3 feet at least. There was a strange bird calling and I couldn't locate it as it sounded as if it was coming from the trees but eventually a guy told us that it was a Sandhill Crane that was circling overhead and calling as it did. We walked across the dam at the lake and there were thousands of Coots in great rafts all along the barrier area. Below the dam where people were fishing there were hundreds of fish in the lee of the dam outlet. I never saw anyone catch one though! After lunch we drove into Jackson Hole and looked around a few shops and visited the Tom Mangelson Gallery. Although we've been there on several occasions it still is an amazing place... on 3 floors with huge leather armchairs that you can sit in to view and decide whether the $5,000 print will look good on your lounge wall. He certainly has taken some great photographs and in particular I love his stuff taken locally in the Greater Yellowstone ecosystem. 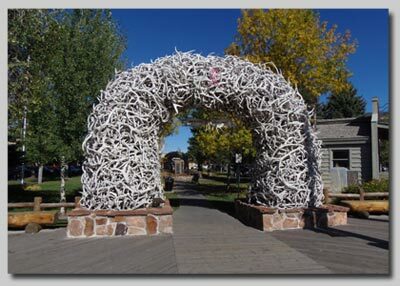 The arch made from Elk antlers in the centre of Jackson Hole town. 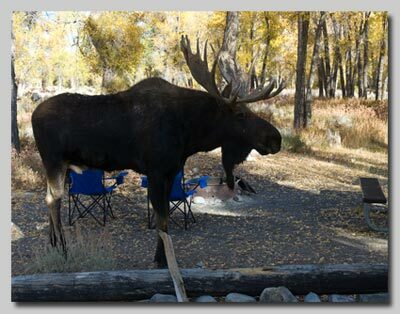 We got back to the Gros Ventre campground at about 4:30 and within a few minutes of getting the camping chairs out in the sunshine I spotted a huge bull moose not 50 yards from the camper. 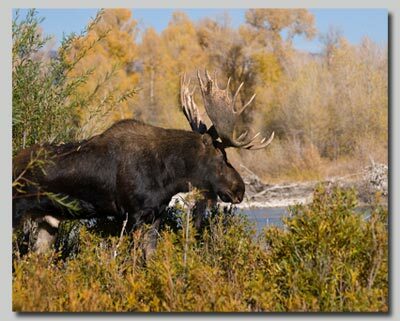 Bull Moose on the Gros Ventre campground. I took a few photos and then followed it up through the willows until it paused to drink in the river. I thought it was going to cross the river so I waded into the side stream which was a bit deeper than I expected and soaked my trainers, socks and the bottom of my shorts!. All of a sudden the moose decided not to cross but to head back towards me and a few other photographers that had turned up. I made myself scarce until he'd settled but he seemed very agitated and was snorting loudly until he then set off back across the campground right toward our camper. 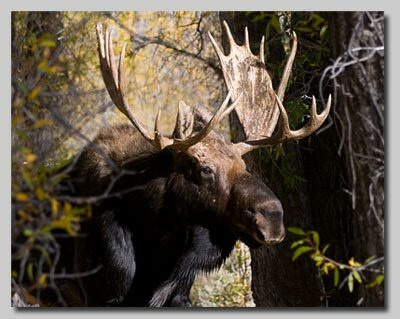 Bull Moose walking toward our camper and barbecue! I could see Linda preparing to close the door as he got closer to the van and I just managed to get inside as well when he actually walked right up to our site and sniffed at the camping chairs and then started to sniff at the back of the vehicle. He was huge and Linda and I were peering out of the partly open door ready to shut it at any time. I got some great photos, some with the 28-70mm lens as he was so close to us. I was pretty nervous that he might jab his antlers at the camper because he kept looking at the van from just inches away. I could imagine the paperwork to the insurance company if his antlers tore though the side of the van! 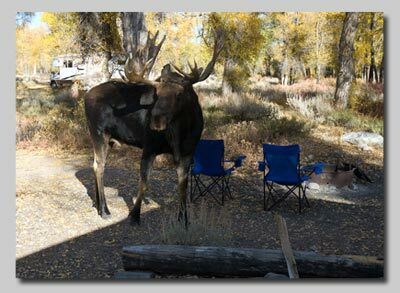 Bull Moose amongst our camping chairs as we cower in the half-open door of the campervan! Fortunately after what seemed an age he moved off across the campground with a bunch of photographers on his tail. We just sat there amazed at the experience of such a huge wild animal being so close to us. I needed a beer after that so we settled down for a BBQ and a few hours around the campfire. Although it was virtually a full moon we watched 5 satellites go over and one shooting star. As the moon rose above the cottonwoods the coyotes briefly struck up again. The moose had been tremendous on this visit but we were sad to leave without any sightings of grizzly bear so in that tried and tested manner "here's one I prepared earlier!". This is from our 2008 trip taken near the road just outside Grand Teton toward Dubois. 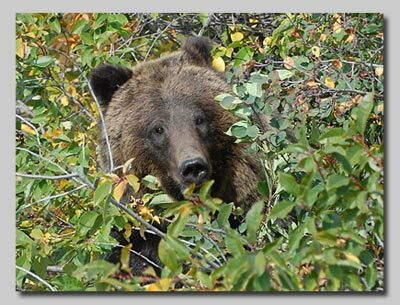 A Grizzly bear from a previous trip. Today we start our long drive back to Denver so that we can hand the camper back on Friday and fly back to London that evening. 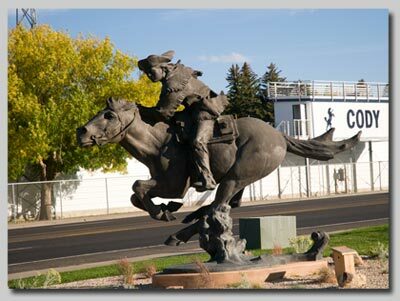 We had thought about going South to Grand Junction and then taking IS70 back through the Rockies of Colorado but we had chatted with a guy from Tennessee yesterday and he told us about the Buffalo Bill Historical Centre in Cody. So instead we headed North back into Yellowstone and around the shores of the Yellowstone Lake and out to the East entrance of the Park. It was the first time we'd gone farther than Sylvan Lake on that road and the scenery was amazing as we descended from the mountains through Sylvan Pass in an ever downward spiral of passes, hairpins and unguarded canyons. Heading out of Yellowstone into the Shoshone National Forest and the east entrance. 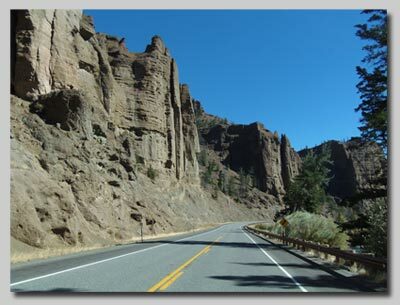 We then travelled through the Shoshone National Forest and some quite fantastic scenery until we came to the town of Cody which was named after William F. Cody, better known as Buffalo Bill. Everything in the town had some link to the man including the hotel he owned called Hotel Irma which he named after his daughter. There was a huge group of buildings displaying lovely modern architecture but also blending into the environment really well. This was the grand Buffalo Bill Historical Centre and it featured numerous floors and displays including a research & resource library facility. We viewed the Buffalo Bill exhibit, the Yellowstone Nature exhibit and the Plains Indians exhibit. All were tastefully done and very interesting. We both thought that we could easily have spent the full day there. 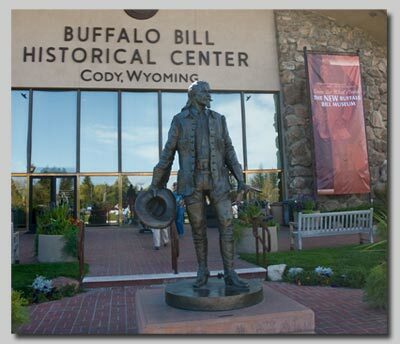 The Buffalo Bill Historical Centre in Cody, Wyoming. 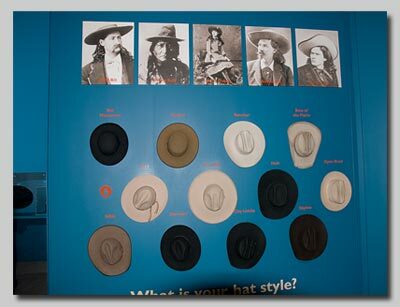 Also in the Buffalo Bill exhibit was a presentation of all the different cowboy hats, many of which you were invited to try on. 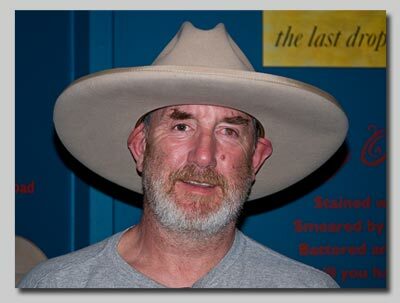 I tried the "Tom Mix" hat named after the legendary Western film actor at the turn of the last century 1909-1935. The following photo shows it wasn't a great fit! Trying the hat's for size....not quite right! After leaving the museum we drove on another 50 miles to stay at a KOA in Greybull in the Bighorn Basin and in view of the Bighorn Mountains. On the way as we were entering the basin farming area there was a huge bird at the side of the road and I noticed it was an adult Golden eagle but it was too late to stop as there was nowhere to pull in and he would have flown for sure if a big white campervan pulled up alongside. The KOA was in a residential area but very smart and tidy and owned by a Dutch couple although there was a fair bit of noise at night as there was a locomotive shunting terminal nearby and the trains were whistling and banging through the night. This was planned to be a day of driving although I didn't quite plan to go so far as we did. We started off fairly late from Greybull after I photographed a squirrel in a tree outside of the camper. I'd planned to go over the Bighorn Mountains to Sheridan and to pick up the IS25 South from there toward the Colorado state line but our campground hostess advised us against it because there was a warning of snow and the road through the mountains can then be impassable. We decided to take the road south of Greybull to Thermopolis which bills itself as being the home of the biggest thermal hot springs in the world. It was then on through the Wind River Canyon, the Wind River Indian reservation and across the high desert toward Casper. It was incredibly windy and it was a continual fight to keep the camper steady especially when large trucks came by and sucked us into their slipstream. We saw hundreds of Pronghorn Antelope on these high plains but very little else. The roads seemed to go on forever. 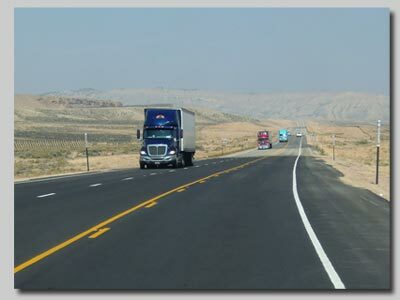 The "never ending" highways across Wyoming. After Casper we drove on to Douglas where we had hoped to stay at their KOA but when we arrived we were disappointed in the look of the campground and decided to keep driving south to the KOA at Cheyenne. It was dark when we arrived and I'd had a few problems finding the site after leaving IS25 and getting onto the IS80 heading east. We did eventually find it and managed to get set up on a site in the bitter wind and as I write this we are warm and cosy in a vehicle being buffeted back and forth by the winds which have come off the Rockies and across the plains just to greet us. After a bitterly cold night we awoke to sunshine but the daily high for today had fallen from 75F yesterday to 46F. Quite a difference and fortunately the wind had dropped a bit so it didn't seem quite as bad. A quiet day was on the cards but first a bit of retail therapy as we visited a Sierra Trading Post outlet and bought some clothes to take back both for ourselves and for our sons'. 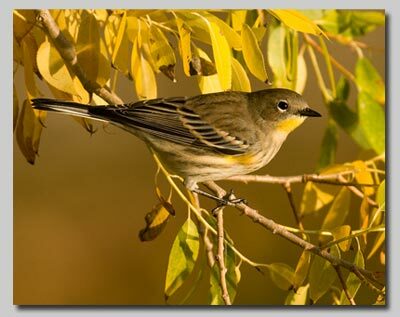 We later drove on down to a KOA at Fort Collins and booked in at a Lakeside campsite which was really nice and we walked the trail around the lake and saw lots of American Robins, a flicker and a Downy Woodpecker. I also photographed some warblers but will need to analyse the photos at home before I can name them. 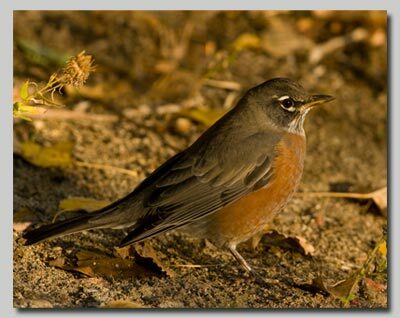 A North American Robin and an unidentified warbler at Fort Collins, Colorado. Cleaned out the camper this morning and threw away all the excess things we had and gave away a few others to neighbouring campers. We filled up with propane and then hit the IS25 fifty miles into Federal Heights in North Denver. After stopping for food and fuel we handed the camper back in to the Cruise America depot and a taxi took us to the airport which is where I type this from now as we wait the 5 hours for our flight back to London Heathrow. Hopefully we'll get away before the snow arrives as they'd had a few flurries in Denver this morning and its forecast to move into the area for the weekend. Arrived safely back into London Heathrow at lunchtime and collected our cases and then our car and drove about thirty miles across to the Holiday Inn at Reading South where we'd booked to stay the night. It seemed strange to be back driving on the left hand side of the road again and being forced to speed up to 80 mph just to stay in the slow lane! We do however prefer to have a relaxing stop in a hotel before travelling back home to Cornwall as it can be a gruelling trip after a transatlantic flight and this way we get home a lot more refreshed. A pleasant drive home and we made it by lunchtime. Cornwall still looks fantastic as always. Some links to places and items mentioned in my text follow and are factual. Some I can recommend and others you need to decide for yourselves! Buffalo Bill Historical Center, Cody, Wyoming. The Hotel Irma, Cody, Wyoming. The Holiday Inn at Reading South. The Springhill Suites at Denver Airport. Curt Gowdy State Park, Wyoming. Slough Creek campground Yellowstone NP. Gros Ventre campground in the Grand Tetons. KOA Jackson Hole - Snake River campground. KOA Fort Collins Lakeside campground. Sinks Canyon State Park, Lander, Wyoming. Tom Mangelsen Gallery, Jackson Hole.